Hello, this is Mitsue writing. How are you doing? In Osaka, it is getting a little hot soon after cherry blossoms shower. And now, we see carps swimming in the sky! Guess what? 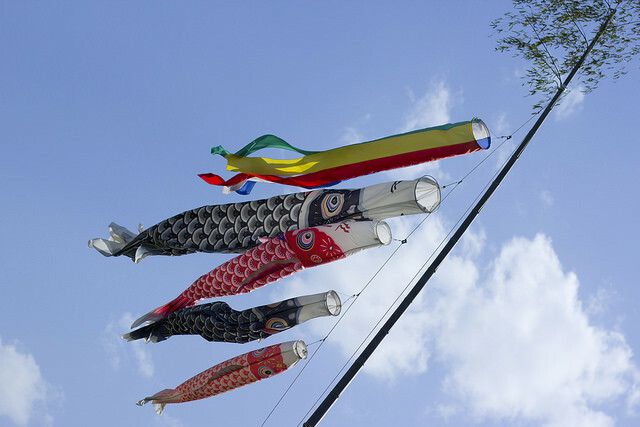 Well, actually they are fabric carps attached to a pole called 'Koinobori' (carp streamer), and we put it on a roof of balcony. The carps blowing in the wind remind of carps dynamically climbing up waterfalls. 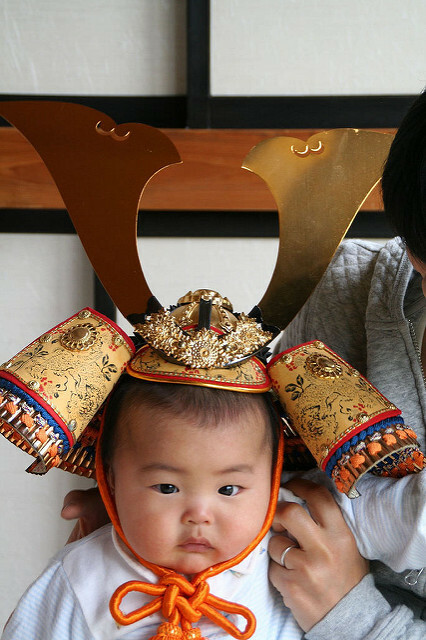 Children's day (May 5th)is a Japanese national holiday which celebrate children's health and happiness. The day was originally called Tango no Sekku, and known as Boys' Day while Girls' Day (Hinamatsuri) celebrated on March 3rd. It became a national holiday renamed Children's day to celebrate the happiness of all children. 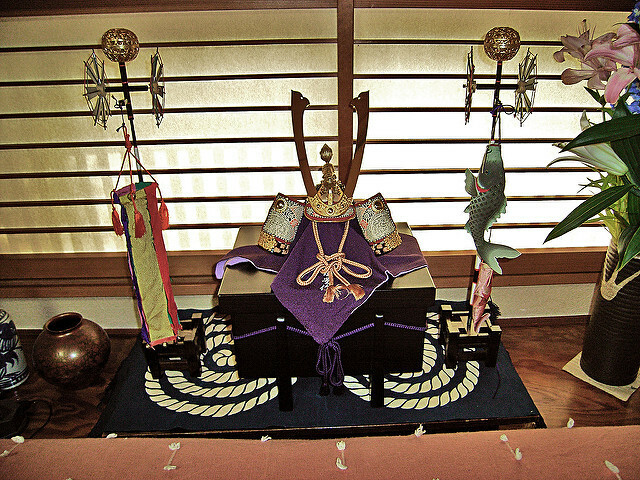 We raise Koinobori because of the Chinese legend that a carp that swims upstream becomes a dragon, and we display the traditional Japanese military helmet, kabuto as traditional symbols of strength and vitality. For my son, I just displayed little Kabuto because there was no space to display a big one. 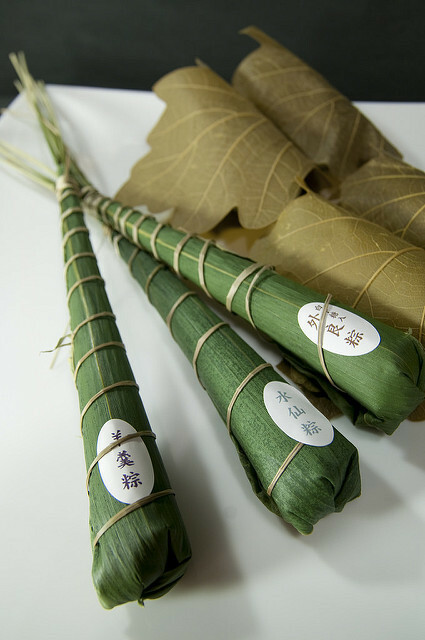 What is the most pleasure custom for me is to eat 'Kashiwa-mochi' (a rice cake which contains sweet beans wrapped in oak leaf) and 'Chimaki' (triangle shaped sticky rice dumpling wrapped with bamboo leaf) on this day! The meaning of using oat leaf is that old leaf does not fall until a sprout grows, so it is a sign of fertility and family prosperity. The origin of eating Chimaki is from a sad legend of China. Chimaki is eaten commemorating the death of Qu Yuan. He was a famous Chinese poet from the kingdom in about 4c BC. Known for his patriotism, Qu Yuan was so loved by people and he tried to warn his king to expand the kingdom, but failed. Qu Yuan's grief was so intense that he drowned himself in the Miluo river on May 5th. According to a legend, packets of rice were thrown into the river to prevent the fish from eating the poet's body. There is also a music 'the Fantasy of Miluo river' recalling his death. The shape and ingredients of Kashiwa-moichi and Chimaki are different depending on its region or home. In Osaka, the below photo is popular. They are so delicious!! I hope Koinobori blows in the wind peacefully every year. Here are some carp design items of ICHIROYA. Why don't you enjoy carp design in this season?